Mae Kampong is one of seven villages in Huai Kaew, Mae On. This upland village is located 50 km northeast of Chiang Mai along the Mae On- Huai Kaew Road. Why Mae Kampong is special ? Mae Kampong village got its name from its physical characteristic of having several streams passing through the village. The early settlers migrated from Doi Saket district, the nearby district in Chiang Mai province, to search for land for the forest-tea orchard cultivation. The topographical feature of the area could be classified as hilly terrain with an elevation of 800-1,000 m above sea level. The pocket-sized village of Ban Mae Kampong has become an offbeat retreat for travellers looking to escape the commercialism of Chiang Mai and rediscover the village way of life. Most visitors are introduced to the area on zipline tours with Flight of the Gibbon, but it's worth coming under your own steam to explore the village and the surrounding jungle. What to explore at Mae Kampong? The beautiful village of Mae Kampong and its surrounding areas have long been a source of enjoyment and inspiration to not only the local people that happily reside there, but also to the fortunate visitors from around the world that are lucky enough to visit it. Home to the exciting Flight of the Gibbon zipline attraction, the village of Mae Kampong offers visitors to this unique area of scenic wonder a chance to take in the full beauty of Mother Nature in her regular surroundings. Located just a short distance from the “Rose of the North” - the city of Chiang Mai - visitors to Mae Kampong will instantly feel like that have stepped back in time, with traditional teak homes dotting the nearby mountains and ranges, and where the local folk go about their daily lives just as their ancestors before them have done for hundreds of years. How to get to Mae Kampong? There is no public transport, but the village is easy to reach with a decent-sized motorcycle or by chartered rót daang – just follow Rte 1317 past Mae On to Ban Huai Kaew, and follow the signed road on the right. You can have some coffee or tea and enjoy gorgeous view from the small cafe on the side of the road. Located just a stone’s throw away is the beautiful and scenic Chae Son National Park, which is home to hot springs, wading pools, waterfalls and walking paths, that will truly soothe any world weary wanderer that is fortunate enough to pass through its mountainous magic. Some cafes offer great view but they're located on slippery slopes. It's not suitable to elderly due slopes/limited toilets. 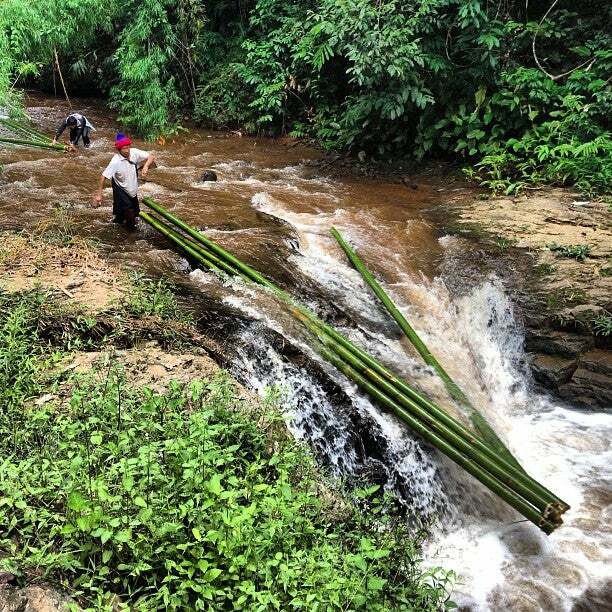 As a visitor to Mae Kampong you can witness the locals go about their lives, and the native people of the area are only too happy to show you their farming skills and let you partake in a little bit yourself. 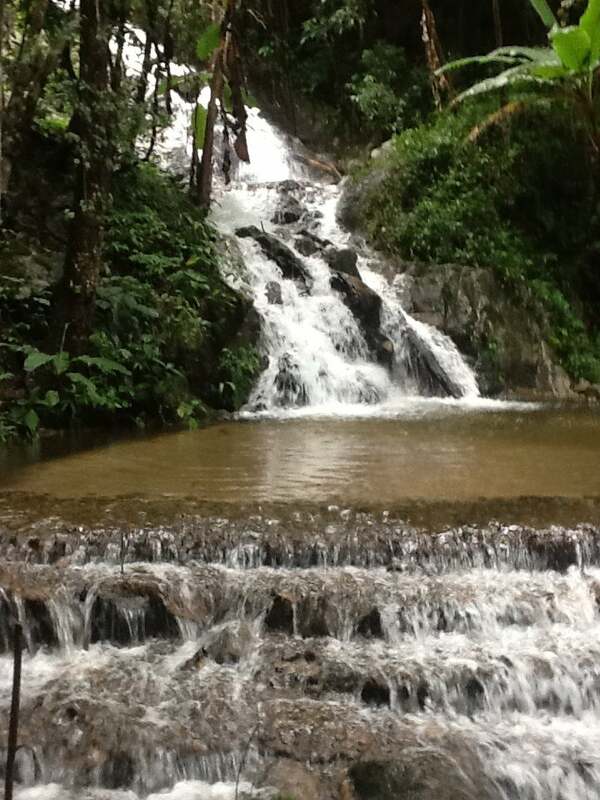 You can also go zip-lining or get an amazing massage or even climb up a steep exquisitely beautiful waterfall in this area. My friends bought Flight of the Gibbon zipline package. We, did not want to fly, can ride along and pay a reasonable price for the transportation and lunch. When my friends were flying in the jungle, we walked up the mountain enjoying the wonderful natural scenery and morning vibration of the village. Walked all the way up, we found this cafe on an open-air platform. The coffee and cake were very good. The view was spectacular. The cafe became busier with visitors, mostly local people from the city to spend their Saturday.